To 8K-10KW motor. KLS controller is supposed to reduce the noise of BLDC motor,especially for hub motor.The BLDC motor must be based on 3 hall sensors.Customers can program the KLS controller on PC software or Android App.You may need a Z-TEK USB to RS232 cable for programming the controller if you want to program the controller on Android Tablet. KLS72601-8080I is designed by opto-isolated technology and supposed to work with BLDC motor with hall sensors..
•Motor Current Limit, continuous: 240A ,depending on the model. 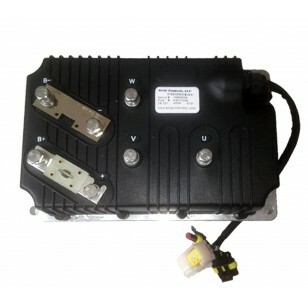 •Motor Current Limit, 10 seconds boost: 600A ,depending on the model. (21) Support Broadcast type CAN Bus function.It is 250Kbps. Caution! The regen is not a safe function.Usually you may use the mechanical brake.